Today’s post is written by Sandra Brotman Domoracki Au.D. CCC/A, OSSPEAC Past President. She has worked with families and their children with hearing loss in the clinical and educational setting. Sandi has also taught on the university level as well as presented at numerous local and national level conferences. I work in Educational Audiology in school districts in and around Summit County and as Project Director for the Regional Infant Hearing Program (RIHP), Region 9. Working in these two roles has allowed me to follow some of the kiddos from the time they are identified with hearing loss through high school. Last month Reena Kothari talked about the Early Hearing Detection and Intervention (EHDI) program. The RIHP is part of that program. There are nine RIHP programs throughout the state and they are responsible for the follow up and tracking of infants who do not pass the newborn hearing screening and for providing family centered intervention to families of children with hearing loss from birth until age 3 years in their natural environment. Each family is provided with the services of a Parent Advisor who has specialized knowledge and experience working with young children with hearing loss. In Region 9 our Parent Advisors are speech language therapists, deaf educators and audiologists. Although we come from various backgrounds we each have a passion and expertise for working with babies and toddlers with hearing loss and their families. It is known that families make the biggest impact on their children’s communication development throughout their daily routines and play. That is why the RIHPs work directly with the child’s caregivers to help enhance their natural abilities to meet the needs of their child with hearing loss. Services are typically provided in the child’s home and families are coached in various strategies to aid in their child’s communication development such as imitation, turn taking, expanding what the child says and narrating the child’s thoughts and intentions. Additionally topics are discussed with families that include turning down the noise and getting close; setting up a good listening environment, understanding their child’s hearing loss, genetics, keeping on the hearing aid(s) and/or cochlear implant(s), literacy, play, and information on communication modalities. The RIHP also provides opportunities for connecting with other families as well as support from other families; both old and new RIHP participants. Often the family has questions about their child’s future and education and RIHP is there to provide resources and help for preschool transition. RIHP is a branch of Help Me Grow and works with the service coordinator and other providers in writing the Individual Family Service Plan (IFSP) and helping to meet the needs of the child and family. I have provided audiology services in the schools for more than 30 years and I have been a part of RIHP for more than 16 years. Oh and the changes that have taken place for children with hearing loss is amazing! When a child is identified with hearing loss early, receives amplification in a timely manner as appropriate and is enrolled in early intervention by six months of age they have the potential to fully develop their capacity for language. As with all of our kiddos the family and their involvement is critical. We now have children entering preschool with language abilities similar to their typically hearing peers. However it continues to behoove us to provide substantial assessments to students with hearing loss so we do not miss delays in their language development, social emotional development, abilities to localize and listen in noise and in poor acoustics, understand abstract concepts, self -advocate and wear their amplification consistently. Because kiddos with hearing loss have difficulty hearing in noise and from a distance they miss out on opportunities for incidentally picking up on spoken messages that are not directed to them. So much of what we learn early in our lives is learned through incidental learning/over hearing and therefore our students with hearing loss can miss out on hearing and experiencing vocabulary their typically hearing peers already know. It is important we do not take their vocabulary development for granted throughout their academic careers. 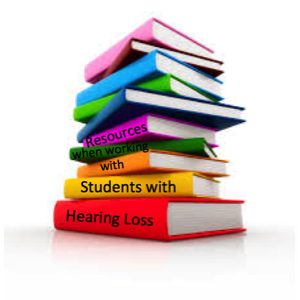 There is a vast array of resources available for working with our students with hearing loss. The cochlear implant companies Advanced Bionics , Cochlear Americas and MED-EL have websites with lots of wonderful materials. Cochlear Americas in particular allows the user to design a specified therapy program with their support materials you will find one hour educational seminars by leading experts on working with students with hearing loss. A few years ago Karen Anderson presented at our OSSPEAC conference. She has a website chock full of terrific articles, activities and handouts HERE. Do you need information on teaching your student to advocate for his/her hearing needs? The above author has information on that as does the Listening and Spoken Language Center. These two sites also discuss Bullying and other issues related to students from early intervention through teens and transition. If you need quick information on a student’s hearing aids, possibly some quick troubleshooting search the hearing aid manufacturers have comprehensive websites and YouTube videos clips for visual demonstrations. Tina Childress was another speaker we had at the OSSPEAC conference. For a curated list of apps, look at this post HERE. We know that with early identification and intervention children with hearing loss can attain their full potential for communication. However there remains a segment of the kiddos we serve with hearing loss as well as their normal hearing peers who enter preschool with a vocabulary gap and that is due to a link between vocabulary skills and economic backgrounds. Studies have found a 30 million word gap exists between preschoolers from the wealthiest families and poorest families. Our poorest students with hearing loss can fare even worse as the word gap widens because of lost opportunities to hear vocabulary in their homes due to noise and distance and therefore reduced incidental learning. If you are interested, to find out more check out the website listed above as well as Too Small to Fail and Project Aspire and the book Teaching With Poverty in Min, What Bering Poor Dies to Kids’ Brains and What Schools Can Do About It by Eric Jenson. For a wide variety of articles and resources having to do with kiddos with hearing loss at school and home have a look at Hands and Voices. Don’t forget a wonderful resource in your own backyard The Center for Outreach Services at the Ohio School for the Deaf that provides Parent Mentor services, Evaluation Services and works collaboratively with your school through observation and consultation. Last but certainly not least as part of the loaner library at OCALI school districts can borrow a personal FM system, for their student with hearing loss, to trial and for data collection under the auspices of an Educational Audiology. Districts are expected to purchase the audioshoes to couple the FM receivers to the student’s hearing aids(s). Well there you go, some suggested reading for your summer enjoyment! As always remember OSSPEAC is here for you and we are happy to provide additional information and resources upon request.